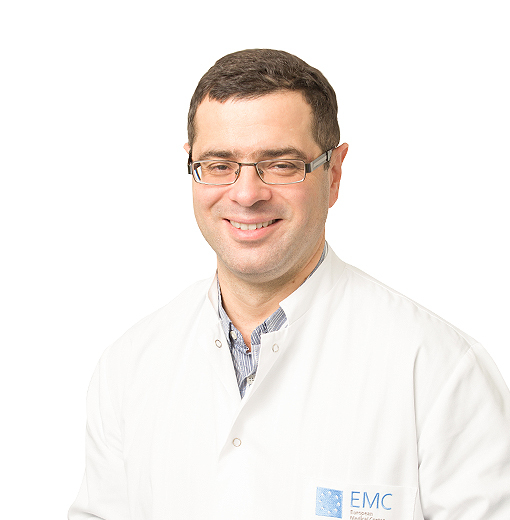 ELKUN Gennadiy, Doctor EMC. Make an appointment, ask a question. In 1988, he graduated from the Semashko Moscow State University of Medicine and Dentistry. He underwent residency in otorhinolaryngology at the Department of the Central Order of Lenin Institute for Advanced Training of Doctors in 1988-1990. Mastered FESS - Functional Endoscopic Sinus Surgery. After completing residency training, he worked as an otorhinolaryngologist in Moscow Municipal Clinical Hospital No. 67. From 2002 to 2012, he served as head of the department of otorhinolaryngology at Municipal Clinical Hospital No.67. He has the highest qualification category in otorhinolaryngology. In 1992 he defended his candidate thesis. In 1998 he defended his doctorate. In 2010-2011 he gained further training qualifications in hospitals in Italy and the Netherlands on rhinosurgery and surgery of the middle ear. The doctor's specializations include the whole range of routine and emergency ENT care, including reconstructive and hearing improvement operations and interventions for oncology of ENT organs.